Katie Johnson visits Troy (Maine) Central School. Katie Johnson, author of Red Flags for Primary Teachers, visits Troy Central School and works with teachers and students on writing and movement. Teachers and students at Troy Central School in RSU#3 had a special day on April 8. Teacher and author Katie Johnson spent the day with the students and teachers of the Kindergarten through the fifth grade classrooms. In the upper grade classrooms, Katie and the students worked on writing, using a section of a book the children already know and love. With the students in Mrs.Judy Kaber's class, she read aloud a passage from Farmer Boy, by Laura Ingalls Wilder, in which the setting is very detailed and clear. Then the students turned to their own writing and revised their settings in similar ways to make them more powerful for their audience. 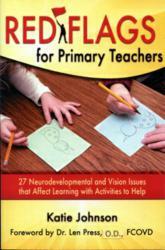 After school, the teachers attended a workshop session with Katie, who demonstrated the Brain Dance and other activities and exercises outlined in her newest book, Red Flags For Primary Teachers: 27 Neurodevelopmental and Vision Issues that Affect Learning with Activities to Help, published by Tendril Press. Katie showed the teaching staff members how to do the BrainDance, a series of eight exercises designed by Anne Green Gilbert of the Creative Dance Center in Seattle. These eight movement exercises replicate the neurodevelopment growth of a child from birth to age two, from Breath to Cross-Lateral patterning. Katie recommended using the BrainDance as a warmup for children at any age. During the workshop the teachers tried out many of the activities for strengthening vision skills needed for reading that are included in the book Red Flags for Primary Teachers. "We all thank Katie for coming to our school and sharing her thoughts and knowledge regarding reading, writing, and vision," says Glen Widmer, Principal. Katie Johnson was a teacher for many years in what was MSAD# 3, at Mount View Elementary School in Thorndike. and also in Seattle, Washington, where she now lives and writes. Katie Johnson’s other books are Doing Words: Using the Creative Power of Children’s Personal Images to Teach Reading and Writing (Houghton Mifflin, 1987); More Than Words: Lessons for the Classroom connecting Literacy and Life (Zephyr Press, 1997); Reading Into Writing: Using Children’s Literature to Teach Writing to Children (Sheridan Books, 2000).